The year is 1998. A string of high-profile alcohol-related deaths has recently rocked prestigious universities across the country, such as MIT, the University of Virginia and Louisiana State University. Fearing such a nightmare scenario might occur at Princeton, the University Board of Trustees launched a Trustee Initiative on Alcohol Abuse to study the problem and propose a comprehensive plan to deal with it. Deborah Prentice, a Princeton psychology professor, publishes a study in the Journal of Applied Social Psychology outlining the role of a phenomenon called "pluralistic ignorance" in influencing Princeton students' decisions with respect to high-risk drinking. Pluralistic ignorance occurs when students tend to misperceive how much alcohol their peers consume and adjust their behavior in order to fit this perceived norm. 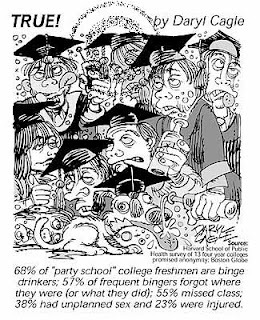 In general, students overestimate their peers' alcohol consumption, and therefore tend to drink more themselves in order to "act normal". Prentice finds that students discussing pluralistic ignorance in a peer setting are less likely to binge drink. Correcting student perceptions is a crucial social science-backed strategy to curb risky behavior and age-old issues with alcohol on campus. The Trustees' final report included a proposal to implement a "social norms marketing campaign" to help counteract pluralistic ignorance and curb binge drinking. Similar campaigns at Northern Illinois University and the University of Virginia have had consistent successes in reducing the rate of risky drinking behaviors; at NIU, the binge drinking rate halved after a decade of social norms marketing and at UVa., the rate dropped 20 percent within two years of the campaign's introduction. Back here at Princeton, the Campus Alcohol Coalition appeared on the scene earlier this decade and replicated this strategy of postering campus with fliers created with student input regarding drinking based on those found at other institutions. Since these fliers won awards in 2004, however, they have essentially disappeared from campus. What happened to consistency? Granted, the posters were often ridiculed by campus satire, but rejection of these messages is likely more an indication that they were not properly designed and targeted, not that this strategy is wholly ineffective. UVa. 's methods, which are aggressive, persistent and heavily student-driven, go beyond posters and show that the social norms approach can be done; changing the campus culture is a longterm effort. McCosh Health Center spent $350 on a line item titled "alcohol/substance abuse" (presumably prevention) in the 2005-06 school year, a total that excludes counseling for these issues. This is probably less than the amount many Princeton students spend on alcohol in an academic year. Even more troubling, this expenditure dropped 95 percent from its peak three years earlier. While UHS has requested a much larger budget for future alcohol outreach initiatives, these cuts over the past few years call into question the administration's commitment to persisting in the approach of targeting and changing campus social norms. The Alcohol Initiative is certainly a step toward addressing these issues, but ultimately the most successful solutions involve concentrating on student psychology. Among all the recent headlines regarding the new RCA alcohol policy was a story of how a group of administrators, faculty members and students are getting together to study high-risk drinking and create proposals to address the issue. Does this sound at all familiar? Again, there are promises to make this initiative student-driven, which is a step in the right direction, but one would hope this is not just another peak in the cycle. The administration's "ongoing concern" regarding high-risk drinking should translate to an aggressive ongoing health and wellness promotion effort to address campus social norms, not knee-jerk responses to alcohol-related tragedies. The focus should be on crafting effective messages to correct misperceptions regarding alcohol, not on imposing an RCA police state that turns peers into law enforcement figures and sours adviser-advisee relationships. One caveat I would like to add is that these messages need to be informative, positive, Princeton-specific and rigorously student-reviewed. The credibility of the speaker matters for ensuring student engagement, as the recent ill-attended USG-sponsored meeting with the administration regarding the RCA policy demonstrates. The lack of student participation at these forums with the administration is likely a referendum on the efficacy of attending such discussions. Unlike posters that appeared around Bicker earlier this year regarding sexual assault, a new effort should not be moralizing and off-putting. Getting a broad, diverse swath of the student body involved instead of just a handpicked group and closely studying UVa. 's successes would be a good start. Ultimately, working towards preventing an alcohol-related tragedy like those we have recently seen lies in changing attitudes. In 2001, President Tilghman said, "We have to get the student body to impose peer pressure, for drinking to become really uncool." The new RCA policy would do exactly the opposite, blur the line between peer and parent, and just make RCAs uncool. Kyle Smith is an economics major from Oakton, VA. He can be reached at kyles@princeton.edu.